Soon after its publication in America in 1835, Finney’s Lectures on Revivals had sold around 12,000 copies. A London publisher printed 80,000 copies and it was translated into French and Welsh. Right after its publication in Wales, a great revival occurred there. Finney viewed his Lectures as his attack on the views of revival held by traditional Calvinists, and as his declaration of what he believed was the proper meaning of revival. For Finney, conversion is not miraculous—a mysterious work of the Holy Spirit—but is merely a proper use of the power to believe that men and women have by nature been given by God . Belief is merely a rational choice. For many, Finney’s making salvation completely dependent upon human choice seemed to suggest that man’s will was not entirely corrupted by the Fall; because of this many labeled Finney a “Pelagian” (after the ancient theologian, Pelagius, who taught that the will was not ruined by the Fall). However, the book was extremely popular, and has had a great influence on subsequent ideas and practices concerning evangelism, especially in its appeal to methods, and by its insistence on the necessity of personal evangelism—lay witnessing—by all Christians. For Finney, revival is as much a work of awakening backslidden Christians as one of saving souls. I. A Revival of Religion is not a Miracle. 1. A miracle has been generally defined to be, a Divine interference, setting aside or suspending the laws of nature. It [revival] is not a miracle, in this sense. All the laws of matter and mind remain in force. They are neither suspended nor set aside in a revival. 2. It is not a miracle according to another definition of the term miracle—something above the powers of nature. There is nothing in religion beyond the ordinary powers of nature. It consists entirely in the right exercise of the powers of nature. It is just that, and nothing else. When mankind become religious, they are not enabled to put forth exertions which they were before unable to put forth. They only exert the powers they had before in a different way, and use them for the glory of God. 3. It is not a miracle, or dependent on a miracle, in any sense. It is a purely philosophical result of the right use of the constituted means—as much so as any other effect produced by the application of means. There may be a miracle among its antecedent causes, or they may not. The apostles employed miracles, simply as a means by which they arrested attention to their message, and established its Divine authority. But the miracle was not the revival. The miracle was one thing; the revival that followed it was quite another thing. The revivals in the apostle’s days were connected with miracles, but they were not miracles. I said that a revival is the right use of the appropriate means. The means which God has enjoined for the production of a revival, doubtless have a natural tendency to produce a revival. Otherwise God would not have enjoined them. But means will not produce a revival, we all know, without the blessing of God. No more will grain, when it is sowed, produce a crop without the blessing of God. It is impossible for us to say that there is not as direct an influence or agency from God, to produce a crop of grain, as there is to produce a revival. What are the laws of nature, according to which, it is supposed, that grain yields a crop? They are nothing but the constituted manner of the operations of God. In the Bible, the word of God is compared to grain, and preaching is compared to sowing seed, and the results to the springing up and growth of the crop. And the result is just as philosophical in the one case, as in the other, and is naturally connected with the cause. I wish this idea to be impressed on all your minds, for there has long been an idea prevalent that promoting religion has something very peculiar in it, not to be judged of by the ordinary rules of cause and effect; in short, that there is no connection of the means with the result, and no tendency in the means to produce the effect. No doctrine is more dangerous than this to the prosperity of the church, and nothing more absurd. Suppose a man were to go and preach this doctrine among farmers, about their sowing grain. Let him tell them that God is a sovereign, and will give them a crop only when it pleases him, and that for them to plow and plant and labor as if they expected to raise a crop is very wrong, and taking the work out of the hands of God, that it interferes with his sovereignty, and is going on in their own strength; and that there is no connection between the means and the result on which they can depend. And now, suppose the farmers should believe such a doctrine. Why, they would starve the world to death. Just such results will follow from the church’s being persuaded that promoting religion is somehow so mysteriously a subject of Divine sovereignty, that there is no natural connection between the means and the end. What are the results? Why, generation after generation have gone down to hell, while the church has been dreaming, and waiting for God to save them without the use of means. It has been the devil’s most successful means of destroying souls. The connection is as clear in religion as when a farmer sows his grain. There is one fact under the government of God, worthy of universal notice, and of everlasting remembrance; which is, that the most useful and important things are most easily and certainly obtained by the use of the appropriate means. This is evidently a principle in the Divine administration. Hence, all the necessaries of life are obtained with great certainty by the use of the simplest means. The luxuries are more difficult to obtain; the means to procure them are more intricate and less certain in their results; while things absolutely hurtful and poisonous, such as alcohol and the like, are often obtained only by torturing nature, and making use of a kind of infernal sorcery to procure the death-dealing abomination. This principle holds true in moral government, and as spiritual blessings are of surpassing importance, we should expect their attainment to be connected with great certainty with the use of the appropriate means; and such we find to be the fact; and I fully believe that could facts be known it would be found that when the appointed means have been rightly used, spiritual blessings have been obtained with greater uniformity than temporal ones. II. I Am to Show What a Revival Is. 1. A revival always includes the conviction of sin on the part of the church. Backslidden professors cannot wake up and begin right away in the service of God, without deep searchings of the heart. The fountains of sin need to be broken up. In a true revival, Christians are always brought under such convictions; they see their sins in such a light, that often they find it impossible to maintain a hope of their acceptance with God. It does not always go to that extent; but there are always, in a genuine revival, deep convictions of sin, and often cases of abandoning all hope. 2. Backslidden Christians will be brought to repentance. A revival is nothing else than a new beginning of obedience to God. Just as in the case of a converted sinner, the first step is a deep repentance, a breaking down of the heart, a getting down into the dust before God, with deep humility, and forsaking of sin. 3. Christians will have their faith renewed. While they are in their backslidden state they are blind to the state of sinners. Their hearts are as hard as marble. The truths of the Bible only appear like a dream. They admit it to be all true; their conscience and their judgement assent to it; but their faith does not see it standing out in bold relief, in all the burning realites of eternity. But when they enter into a revival, they no longer see men as trees walking [Mark 8:22–26], but they see things in that strong light which will renew the love of God in their hearts. This will lead them to labor zealously to bring others to him. They will feel grieved that others do not love God, when they love him so much. And they will set themselves feelingly to persuade their neighbors to give him their hearts. So their love to men will be renewed. They will be filled with a tender and burning love for souls. They will have a longing desire for the salvation of the whole world. They will be in agony for individuals whom they want to have saved; their friends, relations, enemies. They will not only be urging them to give their hearts to God, but they will carry them to God in the arms of faith, and with strong crying and tears beseech God to have mercy on them, and save their souls from endless burnings. 4. A revival breaks the power of the world and of sin over Christians. It brings them to such vantage ground that they get a fresh impulse towards heaven. They have a new foretaste of heaven, and new desire after union with God; and the charm of the world is broken, and the power of sin overcome. 5. When the churches are thus awakened and reformed, the reformation and salvation of sinners will follow, going through the same stages of conviction, repentance, and reformation. Their hearts will be broken down and changed. Very often the most abandoned profligates are among the subjects. Harlots, and drunkards, and infidels, and all sorts of abandoned characters, are awakened and converted. The worst part of human society are softened, and reclaimed, and made to appear as lovely specimens of the beauty of holiness. A controversial statement from Finney. 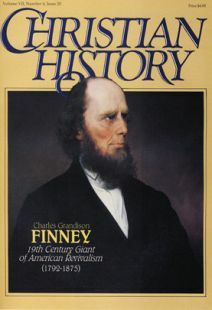 Resources for further research on Charles Finney. Introduction to this Caspar Schwenckfeld issue.